We launched Credit Karma’s product in early 2008 to give consumers free access to their credit information that had until then been difficult or costly to access. It was our hope that we could equip consumers with the information they needed in order to thrive financially. Credit scores were too important to a consumer’s financial wellbeing to be locked behind expensive subscription models. Having begun with these goals in mind, it’s a humbling milestone to have now given away more than one billion free credit scores to our 45 million members. It is a proud moment and a validation of our initial mission, especially given we’ve been able to do this without charging consumers a single penny. We think that these one billion scores have gone a long way to providing much needed transparency in a previously opaque industry and we only have to look to the proliferation of banks and other financial services also now offering free credit scores to see this influence. Over the last seven years our product has expanded greatly, from credit scores, to now include weekly updated credit reports and free credit monitoring, alongside personalized recommendations that help simplify consumer finance and save our members time and money. 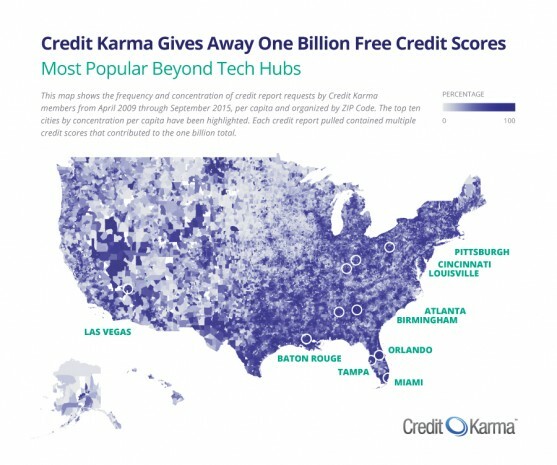 The relevance of our product and the financial pain points it helps members ease is shown in the high adoption of Credit Karma in areas both inside and outside of traditional tech hubs, which has helped fuel a lot of our growth. One-in-five Americans with a credit profile are Credit Karma members, giving us insight into roughly one-fifth of of America’s $11.85 trillion in household debt. At Credit Karma, we feel like we’re still in chapter one, and the future looks bright. We see these first one billion scores as a tremendous base from which to keep developing our product to become more intuitive and helpful to both our current and future members.